Viewing 0 current events matching “art” by Date. Viewing 68 past events matching “art” by Date. The Springboard Social Innovation Forum is a new monthly event designed to engage community members in solving local challenges with lasting solutions. This free event promises a mix of conversation, collaboration, and professional support for social venture launchers, all designed to help move good ideas into action. This month's topic is "Hunger." Hear from gleaners, food educators, school gardeners, state offices, food security policy makers, nutritionists, CSAs and others who are feeding our neighbors---and feeding them well. Join this important conversation to learn where your work overlaps and supports this goal. In conjunction with the forum, nine local artists have converted refrigerators into creative statements about hunger. Their provocative art installation opens Friday, November 7th from 6-8pm at the Urban Grind and will remain on display through the month of November. Pecha Kucha (which is Japanese for the sound of conversation) has tapped into a demand for a forum in which creative work can be easily and informally shown, without having to rent a gallery or chat up a magazine editor. This is a† demand that seems to be global – as Pecha Kucha Night, without any pushing, has spread virally to over 100 cities across the world. Find a location and join the conversation. Drinking and Drawing is an evening of collaborative animation. Each artist has 10 minutes to draw 8 frames of animation. They leave their last frame as a starting place for the person who comes after them, who draws 8 more frames and leaves their last one... repeat all evening. Anyone can participate- artists, animators, people who want to experiment. And people are welcome to attend just to drink and watch the action. The Someday Lounge is 21+ and non-smoking, with food and drinks available for purchase. This event is free to Cascade SIGGRAPH and Northwest ASIFA members- non-members pay $5 at the door. For more information about how it works, visit www.drinkinganddrawing.org. To see the movies we made last year, visit http://cascadesiggraph.org/eventspast.html#Jan_23_2008. To keep in touch with this event, follow @DrinknDrawPDX on twitter. Cinema Project welcomes guest curator Christopher May from TIE, The International Experimental Cinema Exposition. Founded in 2000 in Telluride, Colorado, TIE recognizes experimental and avant-garde film from around the world with a particular dedication to exploring the specific art of celluloid. Curator and founder May travels to Portland with a selection of short films that challenge their very medium. Prolific filmmaker Paul Bartel, pokes fun at the act of filmmaking, acting, and the entertainment industry of the 1960s; while Charlotte Pryce's 2008 The Parable of the Tulip Painter and the Fly, shot on color reversal and hand-processed, is as poetic in its subjects and imagery as it is attentive to the actual film stock. From expanded cinema and reworked found footage pieces, to experimentation with color and lenses, this two night presentation surveys work from both past and present. Screening Location and Admission Unless otherwise noted all screenings will take place at 11 NW 13th Street, 4th floor with a suggested donation of $6 ($3 members). All tickets are available at the door, cash or checks only please. EXPANDED FRAMES passes are $30 and include admission to all symposium events. 11 N.W. 13th Avenue, Portland Located between Burnside and Couch, doors open 30 minutes prior to scheduled start time. Elevator access is provided, please come to the door so we can accomodate. City Center parking is available for $7 on 14th street. For access to the space from the 3rd floor enter from the western stairwell. Corvallis Artisans Market is an outdoor public market featuring the works of local artists and live music. The downtown Corvallis Riverfront comes alive with three great events on April 18 in the same area- along with the Corvallis Artisans Market, you'll also find the Corvallis Environmental Center Earth Faire and opening day for the Corvallis Albany Farmers' Market. OpenTechSpace, TechShop, and Tempus Dictum will present an “Arduino Cult Induction” Workshop at TechShop on Saturday, May 9 2009, from 1 to 5 pm. In this workshop, you will build a complete and functional Arduino-compatible micro-controller (Dorkboard), and will upload and run a program on it. The Arduino development environment is very popular with artists and other creative people, and can be built and programmed even if you have little hardware or software experience. Cre8Camp is an unconference for creative industries professionals. It is an ad-hoc gathering for participants to learn, network and share in an open environment with discussions, demos and interaction all led by the attendees. ...welcomes you to the 4th installation of its lecture series. Where: AboutUs: 107 SE Washington St, Suite 520. Pieces to be discussed include Semaphore-bot, Tangólumen, and Cardiolumen: a multifaceted exploration of the data we create both consciously and unconsciously and their inherent value. Andrew S. Parnell is a Portland based digital artist. His work primarily deals with the physical manifestation of digital information using code, image capture, and electronics. Michael Bunsen spends most of his time on the internet but is more interested in nature and the outside world. He developed Urbanedibles.org and began exploring microcontrollers to cultivate his mission of using the computer to get people off the computer. A presentation featuring works from 2006 to the present, including the recent exhibitions Interiotrope, 2008 and SRO Video, 2009. Dan Gilsdorf is a sculptor and installation artist based in Portland. Using video, sound, and mechanics, his work addresses the mediating effect of technology on physical and cultural landscapes. The installation presents “artifacts” of the past twenty years of war and mineral exploitation in the Democratic Republic of Congo. Partially unearthed artifacts of cultural disarticulation, corporately funded wars, crude hand-tools of small pit mining, skeletal traces of bush meat trade are jumbled together with discarded iPhones, blackberries and obsolete laptops. But, the exhibit won't merely wallow in despair. In accordance with SEA Change Gallery's mandate of social and environmental change, the curators are organizing a public brainstorming discussion to look for sustainable solutions to the coltan addiction. The free event will include a Congolese dinner and encourage community dialogue. Speakers from Mercy Corps, Run for Congo Women, and "Apocalypse Found" author Casey Bush will share their knowledge about the conflict, discuss solutions they are helping implement, and brainstorm ways to take action. Multi Media Art Show & Sale Saturday, Sep 12th 2009 9:00 am - 4:00pm Free Admission Open House---Open to the Public Sales Booths, Raffle Items, Demonstrations, Door Prizes, Snack Bar and More! Show opening: "Dorkbot at ON"
ON Gallery welcomes projects from the Dorkbot community into the gallery for October. Virtual Windows by Donald Delmar Davis The magic window is a pair of computers with cameras. One of which is presented as a window. Maxwell by Mark Medonis A humanoid robot head, telling you about this and that. 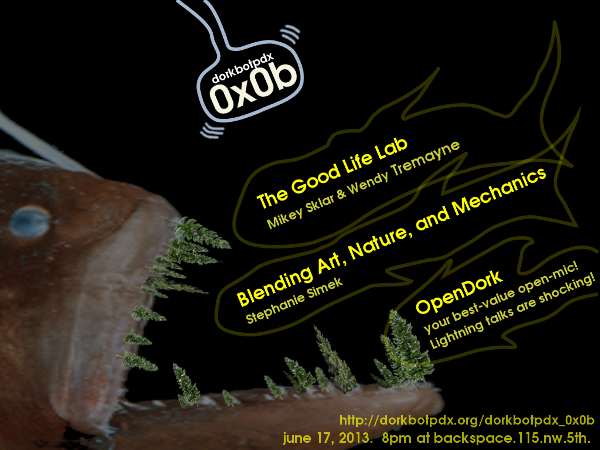 Please come enjoy what occurs at the intersection of art and technology. ON Gallery is proud to announce that Captured by Porches Brewing Company is a sponsor for programs during September and October 2009. ON Gallery is a Portland Oregon art gallery and project space devoted to contemporary interactive art and technology based arts. ON is curated by Benjamin Foote. 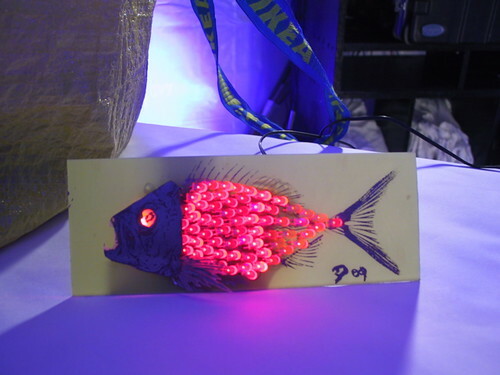 DorkbotPDX is a community of creative types who enjoy experimenting, finding art in technology and pushing the limits of whatever is in front of us. We meet on an regular, informal basis every other week. We welcome you to join us at our gatherings and to bring something interesting to view or ponder. Hands-on items (electrical, mechanical, digital, aural, visual, or other) are highly encouraged! Oct 8, 2009 Adobe User Group PS + AI: Season opener! For experienced users of Photoshop and/or Illustrator. Season opener demonstration: Construction of a fantasy landscape and calligraphy. User group meets regularly.... see website for details. Website also has parking suggestions. The concert will showcase female electronic music performers from Portland and the West Coast, featuring synthesists, sonic explorers, deep listeners, circuit benders, and beat manglers. The performances will cover a wide range of styles, from beat-heavy song forms to abstract noise-generated soundscapes. Some of the performances will also include the audience, in ways that will definitely surprise and delight - and no, there won't be any embarrassing sing-alongs. Probably. Although there is nothing inherently manly about creating or performing electronic music, the female electronic musician is something of a rare bird. Electrogals 2010 will be the fourth in this series of showcases for women who have immersed themselves in this art form. The first Electrogals show happened in 1995 at Mills College in Oakland, when composer Heather Perkins gathered a group of female electronic musicians for a show at the Mills Concert Hall. In 2004, Heather put on another Electrogals concert as part of the Sound/Craft music series at the Portland Museum of Contemporary Craft. In the spring of 2008, Heather Perkins, Mary Wright and Christi Denton put on an Electrogals concert at Holocene, filling both stages with an amazing lineup. All compositions for Electrogals 2010 will be written by Portland composer and performer Heather Perkins, and performed by an all-star roster of female electronic music performers. NOTE: The time isn't listed on the website, it could be inaccurate. Come on by and hang out with interesting people and talk about game development while stuffing your face with pizza and/or beer. PAX is coming up soon, so I'm sure there will be plenty to talk about. See you all there! The event is free and open to the public. Beverages (donation suggested) will be provided. What's happening? Three great and inspiring talks regarding art, electronics, computers, physics, and a hybridized mega monster of all things strangely technical. Did we mention 3D bluetooth kittens and RF aardvarks dancing to the synthesizer sounds of the microcontroller apocalypse? Ok, I made that up...or did I? Jesse will present an overview of a few recently completed projects and a few works in progress. His talk emphasizes bridging the gap between artists and pseudo-engineers, and he challenges the community to come up with a proper term for this crossover behavior. Jesse is an artist and AV nerd represented digitally at anestheticaudio.com. Ward presents an overview of several affordable, contemporary wireless devices and demonstrates how they may be easily incorporated with today's microcontrollers. It's off-the-shelf RF demystified, and you too can go wireless with your projects! Ward Ramsdell is a real engineer who helps takes real products to market. SPROING! is a new web-based word game is like playing boggle in 3D, on platonic solids made of springs, with kittens (& aardvarks). Simran will show off Sproing & its HTML5 implementation, show the design evolution of the game, and give you the math of spring physics simulations. There will be a live multiplayer Sproing tournament during the talk, with chocolate at stake for the winner. Simran Gleason is an artist and a nerd. Usually he makes noise, but sometimes likes to turn physics into games. An open-mic session for those looking to show off a project, ask a question, solicit help, or incite collaboration. The Haunted Garden is a sonic environment that participants control by their mere presence. It is a room that listens to the notes in your voice and uses them to compose music and change the color of the room. As the project progressed, further opportunities for control were implemented. An interactive kiosk gives users the ability to choose instruments and control sensitivity and reactivity parameters. The next step was to insert audio from other times and places by playing field recordings (e.g., baby yaks in Tibet, the 8-line in San Francisco), allowing the Haunted Garden to actively respond to the augmented sonic environments. Simran will discuss the challenges of designing with sound, and how he developed “listening agents” who react and comment on sound in the environment. He will relate experiences—both as software developer and sound artist—and explore sound as a medium. Topics will include what is sound sculpture, what challenges were uncovered in creating it, whether the experience worked according to plan, the challenges in developing applications for these sorts of interactions, the unforeseen consequences resulting from initial forays into these kinds of devices, and how an interface based on sound might change how we relate to sound and sonic devices. About the Speaker Simran Gleason is an artist and professional nerd. He started drawing the day after getting a master’s degree in computer science (symbolic and heuristic computation) from Stanford and drifted through many media before arriving at his current focus: making algorithms that make music. Among his more successful installations is Haunted Garden, a room that listens to you, finds the notes in your conversation, and uses them to compose an ambient sound and lightscape. He also did the generative music and light algorithms for SWARM, a gaggle of open source someday-autonomous spherical robots. His work has been shown in galleries in San Francisco and Palo Alto, as well as installations at Maker Fair, Yuri’s Night, Coachella, and the special olympics of art: Burning Man. Kepler’s Orrery is his first iPhone app. In this introductory workshop, we'll walk through a few different approaches for creating screen-based digital artwork using code. We'll be learning Processing, a free open-source programming language & environment for creating realtime graphics. Processing has become an immensely popular tool for artists and designers to create interactive artwork, data visualization and generative processes. The topics for the workshop include an introduction to the Processing environment, working with images, basic animation practices and generative art. Some prior familiarity with programming will be helpful, though not required. Semi-Permanent's purpose is to unite and inspire the diverse and exciting creative world by bringing together a panel of exceptionally talented, globally renowned speakers via a premium event experience. Moving into its 11th year, Semi-Permanent is the most successful event of its kind in the world - born out of a desire to unite the world's creative communities. Semi-Permanent combines speaker presentations, exhibitions and parties into a festival of creativity. A refreshing look at the current state of the art and design world - both educational and inspiring. A not to be missed event on your yearly creative calendar. After Party at 'The Cleaners' Ace Hotel will be featuring a variety of Artwork, drinks, music and good times for all. Come on down to meet the speakers! People doing strange things with electricity...in Portland! Glenn Phillips got into the computer business around the era of the Mac Plus. Glenn's last job was the owner of Gorge Networks Inc. a rural Internet provider using fixed wireless and dsl. The business was sold in 2010 and Glenn has been on the Obama plan ever since. Glenn became interested in the Arduino a couple years ago, but he had no programming experience. At some point in the process Glenn began to control servos and motors from his old RC collection. Computer control of motors was fun, interesting and possibly a job in the future. Self balancing robots seemed to be the holy grail of motor control! Constant feedback from sensors is processed and translated to power and direction of the motor. Any issue with any component of the system is immediately apparent. Glenn is also a cheap Yankee so his creations use salvaged parts from electric bikes, scooters, wheelchairs, laser printers and computers. Learn about the mutant savior and our efforts to save the last human family. We will talk about the Chuch of Robotron installation at Toorcamp 2012. It involved many different types of materials, skills, and work. We used microcontrollers, plywood, and cast away junk to create a brand new immersive experience of Robotron 2084. On top of that, we had performance, writing, and art to complete the branding of the Church. We will show what a lot of people working together can accomplish. We hope to inspire you to take up the two eight ways! Mikey & Wendy live in Truth or Consequences, New Mexico and have been homesteading there for the last seven years. They produces their own power, fuel, food, water and building materials. Mikey will be explaining how a little bit of embedded hardware can empower anyone to leave their day jobs and focus on the interests. Projects such as grease car temperature displays, irrigation moisture monitors, pulsed LED growlights, using machines to build with trash, fermentation controllers and recovering different battery chemistries. Mikey is a open hardware developer who has been selling kits and has worked for Adafruit, Hack-a-Day, and Popular Science. This will be his fifth dorkbot presentation. Stephanie will be speaking about some of her recent art projects involving light, sound, and electrical components. She'll talk about her interest with combining disparate materials and pushing the limits of their inherent functional capabilities, like playfully incorporating circuitry with handwriting and the movements of Venus Flytraps. She'll also discuss her newest project, a crystal radio sculpture. Other topics to be covered include: synchronized swimming, the Golden Record, non-Newtonian lovers, and Cab Calloway. Stephanie Simek has been living in Portland for 6 years, where she has been creating experiments with sound, performance, and sculpture. Throughout the month of June, Place Gallery will be exhibiting her most recent project, Radio Room. Every Wednesday 5-8pm Flux is open for folks to come by, work on a project and jam on ideas. Come on down. We're on the Second floor, take a right at the top of the stairs. Some folks will be finishing up assembling Mixtape Alpha Kits. Every Wednesday 6-8pm Flux is open for folks to come by, work on a project and jam on ideas. Building community while building out the space. Family friendly event. No experience necessary. Show up at 6 and join a team and get to work on one of the three tasks we'll be tackling this evening. All tools and equipment provided. Bonus points if you can donate any of the following to Flux: masking tape, extension cords, more power strips, more pegboard hooks, dish drying rack, silverware, or mugs. And, closing out the night: DJ Mr. Moo! Got questions? We've got answers! What is Playtesting? Playing a prototype of a new game, to help the designers improve it. Is this really all ages? Can I really bring my 8 year old? Yes, really! We encourage attendees to bring their children! What if I'm not a geek or into science? Will I still have fun? Antimatter Matters is an easy game to learn, thecombines elements of chance and strategy, it can be played in competitive, team-based or cooperative modes, and it requires exactly zero prior knowledge of quantum physics. Abraham Fagolavitz is a figment of his own imagination living in the Tualatin Mountains with a workshop full of tools, piles of recycled and raw materials, and way too much time on his hands. Like the mockingbird’s song, his work is a mish-mash of whatever he finds interesting at the moment and, more often than not, holds no meaning other than it pleased him to make it. Please join us for a Feminist and Queer Art Wikipedia Edit-a-thon, to be held on Saturday, September 13, 2014 from noon–4pm at the Independent Publishing Resource Center (IPRC), located at 1001 SE Division (97202). Prior Wikipedia editing is not required; assistance will be available the day of the event. Female editors are particularly encouraged to attend. Participants should bring their own laptops and power cords. Portland Open Studios provides opportunity for everyone to visit artists and see them at work. Nov 8, 2014 Hack day with uncontext. Let's get together again and made some art! After the success of the TUIO Jams, we're going to try the same format for a different project. uncontext., for the uninitiated, is a community art project that creates streams of constantly changing data that is publicly accessible. When you create something that uses the data as it streams live, it will move and update to the same heartbeat that is moving and updating every other creation using the data. So at the end of the day, we'll have a series of experiments and projects that are all pulsing to the same beat. Anything that can connect to the internet! The space is, as always, provided by the ineffable Instrument. We'll have coffee and lunch will be provided by the wonderful team at Codepen, as well as some swag both from sponsors and also generated and printed at the event! If you want a quick intro to uncontext., here's a video of a 15 minute introduction presentation crammed into 5 minutes from a couple months ago. Send John Brown a message if you have any questions! Designers and artists are discovering the power of combining their knowledge of patterns, space, and colors with code and frameworks. Not to make prettier websites, but to create art. Interactive and infinitely generative code art. But fear not: though getting into programming can be incredibly intimidating, code art, is one path to coding that can be fun, easy, and instantly rewarding. John Brown will show you some frameworks and sites that will get you started making art quickly and easily. Occasionally, a new discovery will come along that changes the way artists create. Pigments in antiquity or screen printing in the recent past have given artists a path to explore. Now computers, and the frameworks created for them, are hitting the sweet spot of ease of use and power. Code art is still in its infancy, and creative coding is the wild west. It’s all about exploring, layering, and trying new things. Any creative endeavor of the last 5000 years has a digital equivalent, and there are myriad digital art paths that have no physical analogue. John Brown will show you how to get involved in creative coding. There is a great community locally he’ll introduce you to. He’ll also talk a bit on the history of creative coding, show you some of his work, and talk about the future of code art and how it fits into the greater art world. When you leave, you’ll want to rush home and pick up a digital paintbrush and start making code art. All meetings are open to the public. Please feel free to drop by to say hello, ask questions, or show off something interesting! We currently have casual, bi-weekly meetings every other Monday. We also have less-frequent "formal" meetings featuring presentations, performances and other interesting activities like OpenDork (where anyone can have a few minutes to discuss their latest project, ideas or whatever). Watch this space for announcements. Laen will talk about the beginnings and growth of the DorkbotPDX PCB Order, and how he turned his hobby into work. Laen is the founder and owner of OSHPark, and doesn't like writing bios. World peace begins with mustaches. Tom Selleck, Burt Reynolds, Salvador Dali, Frank Zappa, Freddy Mercury, and Hulk Hogan have all harnessed the power of the mustache. It's time the rest of the world joined their ranks. Mustache Mayhem is a hardware hack, a video game, and an interactive art piece rolled into one. Based on the short-lived Nintendo Virtual Boy video game console and retro-fitted with a BeagleBone Black Linux computer, the project provides a singular, entertaining goal: Overlay virtual mustaches onto real-world faces for points. In this presentation, Joe details the trials and tribulations behind creating his most ridiculous oeuvre yet. Joe Grand (@joegrand), also known as Kingpin, is a computer engineer, hardware hacker, product designer, teacher, advisor, runner, daddy, honorary doctor, TV host, member of L0pht Heavy Industries, and the proprietor of Grand Idea Studio (grandideastudio.com). Your short (5-minute) ligtning talks about an interest or project you've been working on! Operating in and around the OMSI complex, Portland's Mini Maker Fair 2016 is expected to draw around 20,000 visitors over this 2 day extravaganza of creativity and making. With a wide range of local makers, presentations, workshops, activities and vendors, there's literally something here for everyone. From textiles to sculpture, 3d printing to bee keeping, steampunk hovercraft to supersonic ping-pong balls, you never know what you'll find as you explore Portland's Mini maker Faire 2016. Getting Tickets Tickets to the 2016 Portland Mini Maker Faire will include the north parking lot and the museum. Food & Drink A food cart pod will be serving up local food and flavor, with Full Sail beer, Union Wine Co. wine, and Reverend Nat's hard cider available at the bar. OMSI's restaurant, Theory, will also be open with wood-fire pizza, salads, sandwiches, and Salt & Straw ice cream. 50 Licks Altengartz Aybla Grill Hungry Heart Moberi Smoothies Nineteen27 S'mores PDX Sliders Right Bayou So Cold Sweet Day Tamale Boy Taqueria la Merced Cash and credit cards will be accepted at the bar, but some food carts are cash-only so please plan accordingly. An ATM is available inside the museum. The Portland Mercury proudly presents, BetaCon: Oregon's first major video game and technology expo. BetaCon's mission is to bring together gamers, technology fans, educators and innovators. Connect with developers, designers and artists, try new titles, meet studios and inventors, compete in contests and competitions and attend betaLIVE panels and conferences. Experience the future of gaming and technology at BetaCon. BetaCon takes place in Portland at the Oregon Convention Center, April 15 & 16, 2017. Apr 14, 2018 Want to to be an Artist by learning ProCreate? Garrett will show his tips and tricks to making digital art. Do you want to learn and share your passion in a supportive community? Free Knowledge Mission is an ethos of sharing, creativity, and inspiration. Exciting News, we're moving to Portland Community Church! What a great time for a new location the week after our two-month project preparing for Maker Faire. This week we'll start brainstorming new community events or projects we can work on. Here are a few examples. Bring you're ideas and let's work on a project together. In addition to the above topics, the following has been discussed at CyborgCamps around the world: cyborgs, wearables, prosthetics, sensors, control systems, assistive tech, transcendence, transhumanism, technological singularity, artificial intelligence, intelligence amplification, utopia / distopia / weird topia, identity, quantified self, exocortex, ubicomp, robots, sensory augmentation, steam punk, philosophy, ethics, intelligence, the borg, hackerspaces, telepresence, science fiction, DIY, cryonics, cybernetics, open source, nanotech, augmented reality, brain-computer interface, artificial life, functional electrical stimulation, and neural science. Each CyborgCamp has its own mix of topics created by what the attendees want to discuss. All CyborgCamps follow a Code of Conduct. Nov 3, 2018 Inktober Show and Tell? Did you participate in Inktober this year? Even if you missed, there are still a few days left. Bring and share your stuff. I'll share my sketches I worked on this month. Have you tried any other Art challenges recently? We'd love to hear about it. It's springtime, and it's time to get outside. Do you need some motivation to share your artwork with the public? How about setting up in the Park and inviting people to encourage you to create? Bring your drawing pads, ipads, paints, and easels; or just come hang out and talk to other talented artists. I'll be set up on the riverfront near the Salmon Street Springs Fountain in Downtown Portland. Look for Garrett with an iPad at the steps where the Portland Spirit embarks. This event is weather permitting. Keep an eye on this Meetup 24 hrs in advance for cancellations due to heavy rain forecasts.